Maxi Health Research brings you the only kosher certified liquid Kyolic available! 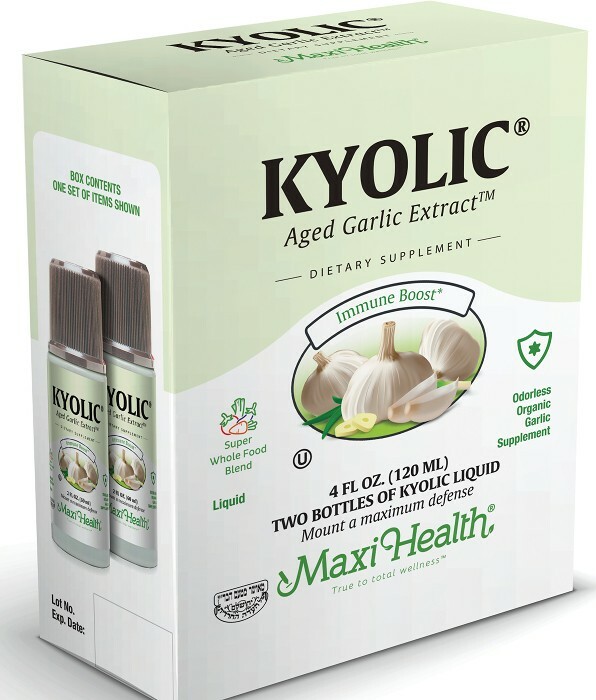 Get Kyolic® Aged Garlic Extract™ liquid, only from Maxi Health! Children: ages 1 & up, take 1/4 teaspoon (8 drops) up to 3 times daily. Adults: Take 1/2 teaspoon (16 drops) up to 3 times daily, or as directed. Infants: Discuss dose with a healthcare practitioner. Mix with your favorite beverage. Other Ingredients: Water and residual alcohol from extraction and caramel color. This product contains no animal products, soy, wheat, gluten, yeast, salt, sugar, corn, milk, artificial flavors, colorings or preservatives. My children were getting frequent ear infections. I put them on Kyolic and it really helped. I have 3 children on Kyolic and we rarely have ear infections. Did you know; Kyolic (15 drops) given to a child with a bad cold and vitamin C and Echinacea can prevent from going to the doctor every two weeks in the winter. Kyolic is also good to give for kids that have pinworms or any kind of parasites, to prevent give every day, 15 drops, (Chewable Oraldophilus can help as well). A few weeks ago my 3-year-old daughter suffered from a bad cold. She had a sore throat but not strep. She was coughing very badly and had a terrible runny nose. I went into my local health food store and asked for help. They gave me Panto-C-Elderberry extract and liquid Kyolic. What should I tell you One thing: Baruch Hashem! It really helped her get over it quite fast! Thank you for doing such a good job! My children used to suffer from pinworms and I couldn't get rid of it. It constantly came back. My healthfood store and pediatrician recommended Maxi Health Kyolic and my kids actually liked it. When I gave it on a daily basis, I finally was able to avoid the problem. My now eight year old had been on antibiotics nearly constantly, from when he was born until he was about three. I was a permanent fixture at the doctor's office, sometimes visiting a few times a week. Each time, he was diagnosed with something else – a sinus infection, ear infection, throat, bronchitis, and even pneumonia. By the time he was two years old, the doctor recommended that we get his adenoids removed, and the ENT agreed with the diagnosis. Surgery on a toddler in not pleasant, and this was no exception. I waited with bated breath to see the wonderful results. However, they never came. Shortly thereafter, I found myself at the pediatrician again, and the ENT again. Finally, I spoke to somebody, who recommended giving him elevated levels of Vitamin C, and Kyolic. Finally! Whenever I was “good” about giving him the vitamins, he went happily off to cheder each day. As soon as I lapsed in giving it to him, like Erev Pesach, the effects were immediate. His nose started running again, and we were on to the next antibiotic. Baruch Hashem, Maxi Health's products were there to help him, until he outgrew this cycle. My 6-month-old baby was always congested. It affected her eating and sleeping. I tried Maxi Kyolic Liquid. Six months later her nose is still clear! My 2 year old daughter had frequent ear infections. I was concerned that repeated antibiotics might weaken her immune system. I decided to go the natural way with Maxi Health Kyolic Liquid and Vitamin C. After a month she no longer gets ear infections! My 6 month-old baby was always congested, it affected her eating and sleeping. I tried Maxi Kyolic Liquid which helped to clear up the congestion! My son was having constant ear infections. A friend recommended Liquid Kyolic. After 6 weeks we saw a drastic change for the better. My 3 year old had frequent colds and ear infections. A neighbor whose child had the same problem recommended Maxi Liquid Kyolic.Two and a half years have passed and we have been to the doctor rarely! Now all my children take the Kyolic! Thank you for all your wonderful products! Our vitamin cabinet is well stocked with many useful Maxi Health Vitamins, which we use for prevention to keep us healthy and for curing some small ailments where we try to avoid antibiotics. One product we've had tremendous success for many years is the Maxi Health Kyolic. We drop it into an infected ear for ear infections instead of giving antibiotics and we've had lots of success with it! Keep up your great products! When my throat hurt, it was very uncomfortable. Sometimes at night I get out of bed and take Kyolic and it helps even as I swallow it. I can truly say that my two children had a healthy winter. I gave them your Kyolic Liquid. Thanks for helping to keep our children healthy and strong! In our family we use a lot of Kyolic Liquid. My daughter loves it, it is her best friend when she has a throat or ear infection. She already knows to ask for it.